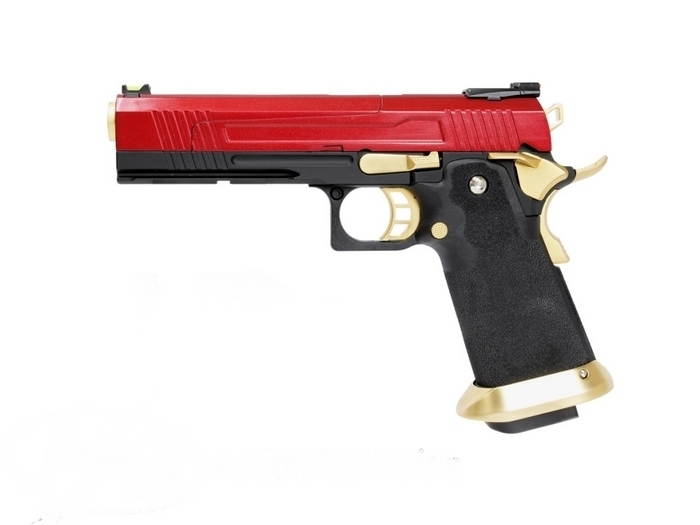 Armorer Works Hi-Capa Custom Split Red. Trigger, Flared Magazine Well and Magazine Release. making the pistol perfect for Practical Pistol Shooters. control and makes it easier to hold for Glove Users. which makes them stand out on the field. Mini Red Dot / Docter Sight Plate Included. Low Recoil, perfect for Target Shooting. Beavertail Safety. The weapon will not fire without being held. Mock Light Enhancing Fiber Sight. Works with Marui & WE Hi-Capa 5.1 Magazines also Co2.